If you are planning to take domestic flights within India – like what we did with Jet Airways for flights to Udaipur and Srinagar, do note that there are differing practices of airport security clearance and some can be really stringent e.g. the Srinagar airport. I will be sharing in this article on what you can expect from these clearance processes and how you can make the necessary preparations to clear them without hassle. These suggestions apply for both domestic flights within India and international flights out of India. The general security requirements (applicable to any airport around the world) of no firearms and dangerous items in checked-in baggage and no liquid in hand carry baggage, still applies for India’s airports. Only passengers and people with official duties in the airport are allowed into the airport (you will need to show your boarding pass and passport before you enter the airport). In addition to the above, you are required to collect “chops”/stamps on tags for your hand carry bag and stickers for your check-in luggage as part of the security clearance process. I will share more details (with pictures of what you can expect to collect) below. Be prepared to be frisked physically by the airport security staff at the first layer of check as you walk through the metal detector into the secured area of the airport. 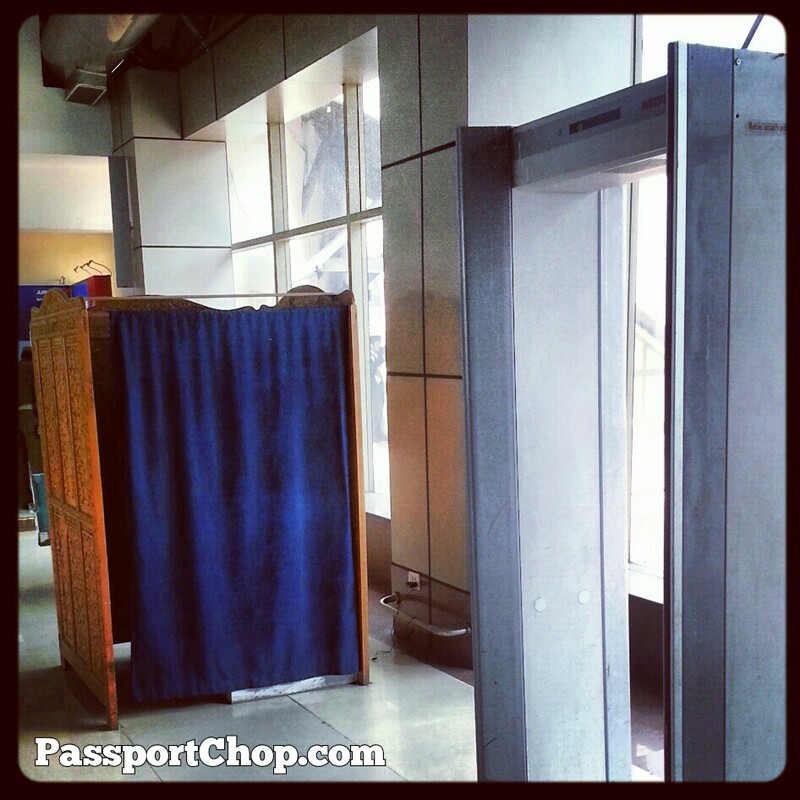 The frisking can be quite intimate (whether the metal detector goes off or not, you will be frisked) and female travellers will be sent into the “box” with curtains/doors (like the one in the picture below) where the frisking will be carried out by a female security staff. There are also separate queues for males and females at the metal detector so don’t queue at the wrong one! Pick up a luggage tag for your hand carry bag at the airline check-in counter before you clear the first layer of airport security. You need a tag for each of the hand carry bag you have so if you have 2 bags, you need 2 tags (one on each of the bag). 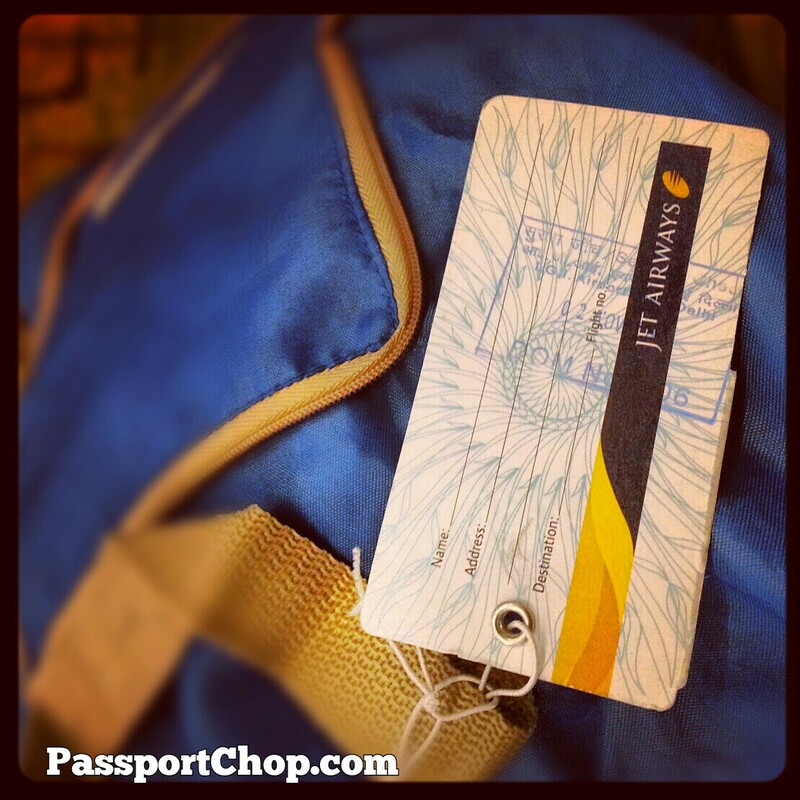 You don’t need the tag of the airline – you just need a tag of some sorts for your bag. Once your hand carry bag clears the first security check, the airport security staff will “chop” or stamp the tag on your bag. Just before you board the plane, the security staff at the boarding gate will need to see the stamped tag. DO NOT LOSE this tag before you clear this security check or you will have to go all the way from the boarding gate to the first layer of security check to get your hand carry bag scanned again. Some airports can be very big e.g. 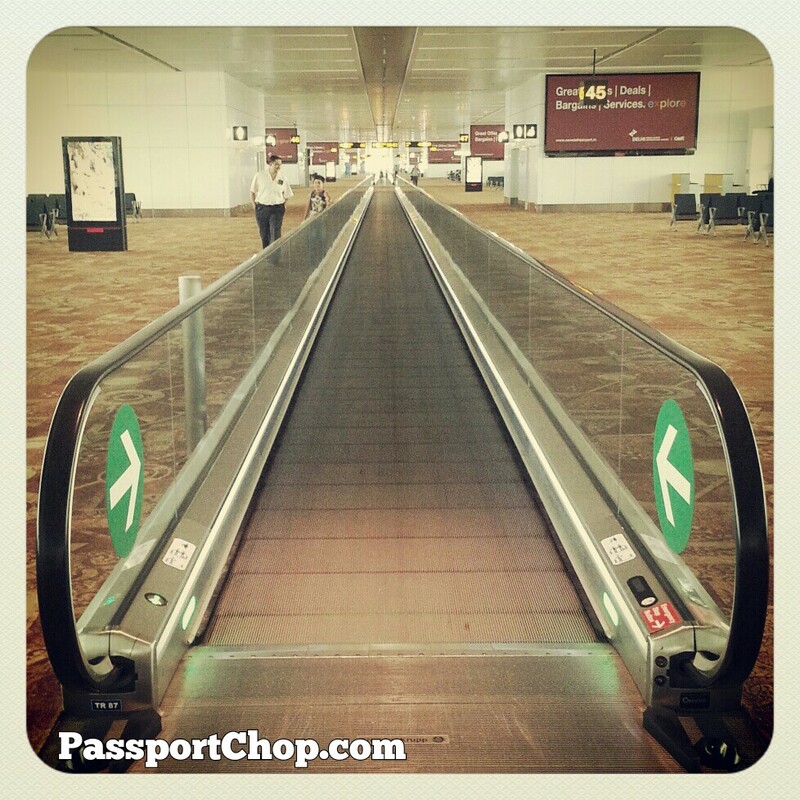 Delhi airport where there are travellators after travellators – you might need 10 – 15 minutes walk at a leisurely pace from the main airport area (where all the shops and restaurants are) to reach your boarding gate so do plan for some buffer time if you plan to eat and shop at the airport. Of course, with such a long walking distance – if you lose your tag on your hand carry bag and didnt realise it until you are at the boarding gate at the last minute, you might just miss your flight. Most airports e.g. 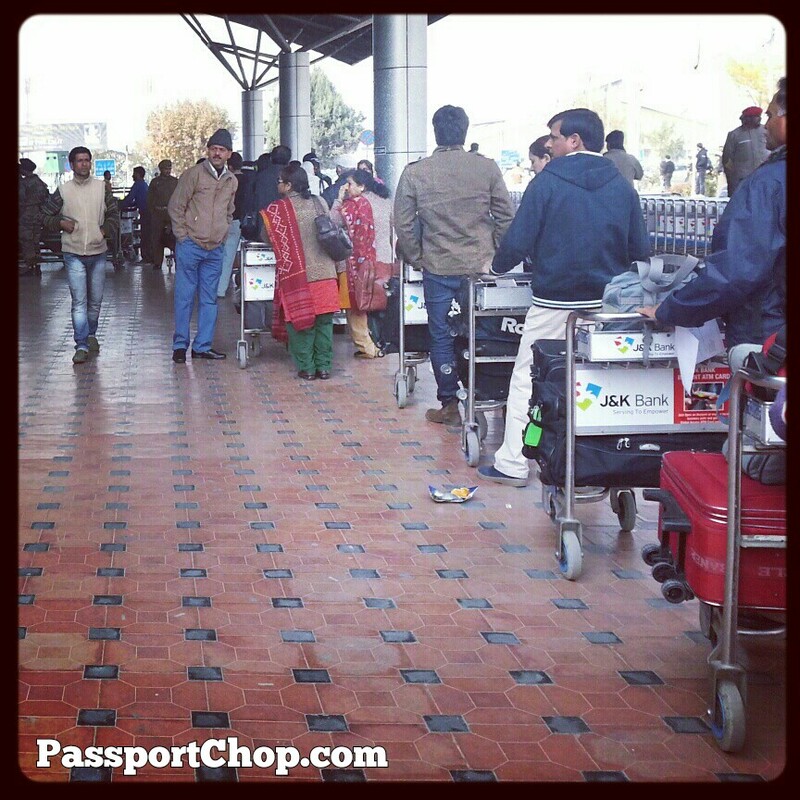 Udaipur and Srinagar require your luggages to be scanned before you check them in. 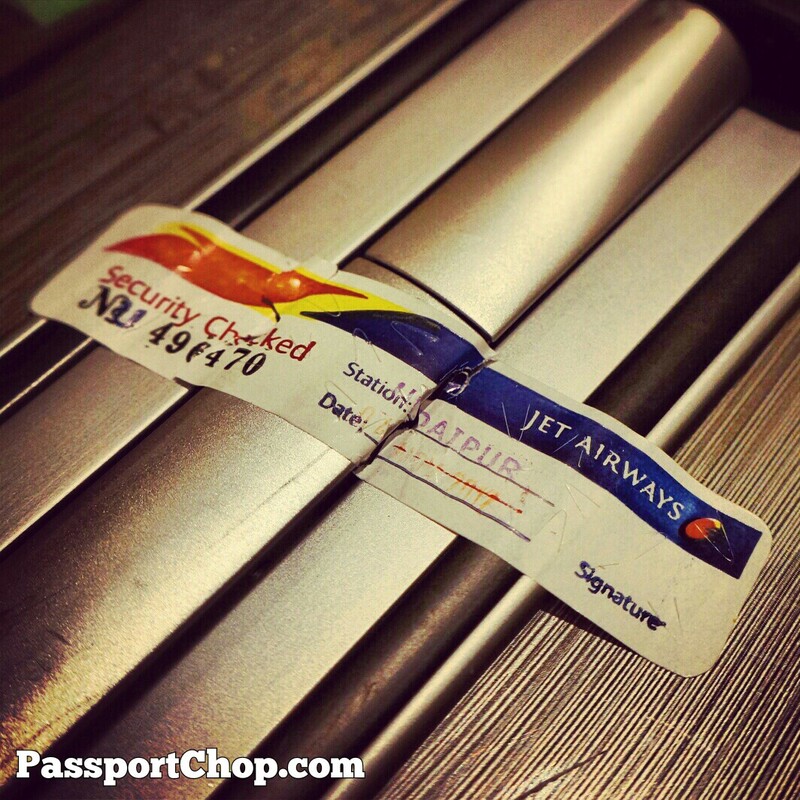 After scanning these luggage and the luggage are good to go, airport staff will paste a security-cleared tamper-proof sticker (see picture below – the picture shows a sticker that has been broken; it should be intact before you checked in) at your luggage zips or any point of entry to your luggage. You will be turned back at the airline check-in counter (you have to get a new sticker by re-scanning your luggage) if you don’t have these stickers on your bag or if these stickers broke (as a result of you opening your luggage after scanning the luggage). However, staff of some airports might not actively remind you to scan your luggages prior to check-in and then you will see a mad scramble for the scanning machine at the entrance of the airport when travellers realise the need to get these stickers on their luggage. If you are not sure, ask the airport staff if you need to security-scan your checked-in luggage. The above pointers cover the very basics of security clearance procedures in India’s airports – domestic and international as at 25 November 2012. Do check with the airport staff if you are unsure and if there are any other new procedures being introduced. 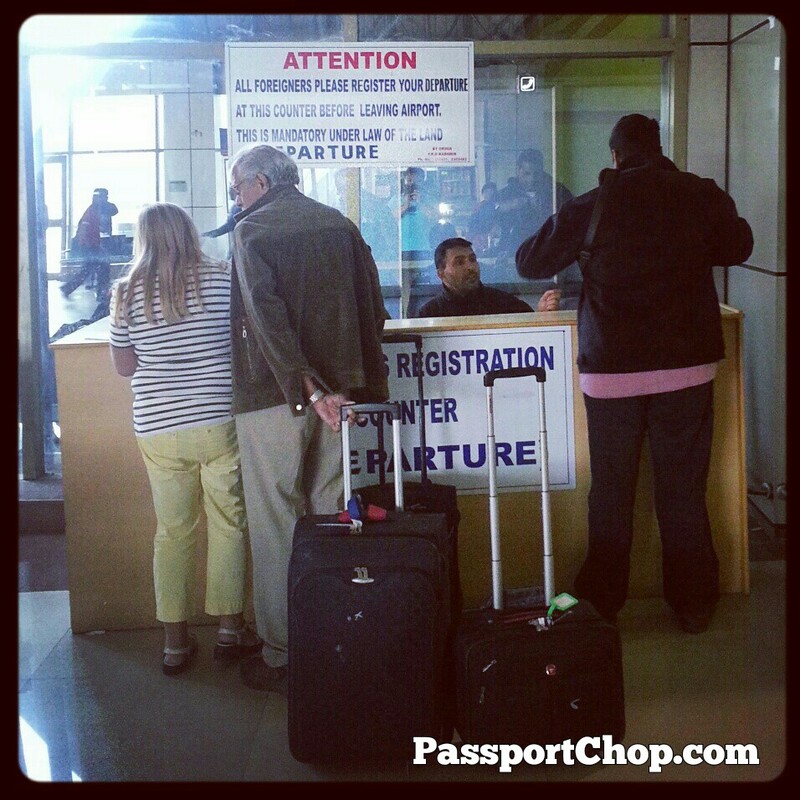 Security clearance at Srinagar airport comprises a lot more procedures, queues, checks, stamps etc. For most India’s airports (international or domestic), you need to be at the airport at least 2 hours before your flight departs so that you can clear security in time. However, for Srinagar airport, you need at least 3-4 hours before your flight because of the increased security measures. The Indian army and air force maintains a very strong military presence at Srinagar airport – in fact the airport also seems to double as an air force base. Thus photography is strictly not allowed during any plane’s takeoff, taxiiing and landing at the airport. If in doubt, don’t take any photos of military persons or installations in and around the airport. Foreigners are also required to register themselves at the Foreign Registration Counter upon arrival and departure to and from Srinagar airport. Do not forget this step! You will need to fill in some basic info of who you are e.g. name, gender, nationality, home address and what you are doing here in Srinagar and where you are staying in Srinagar. 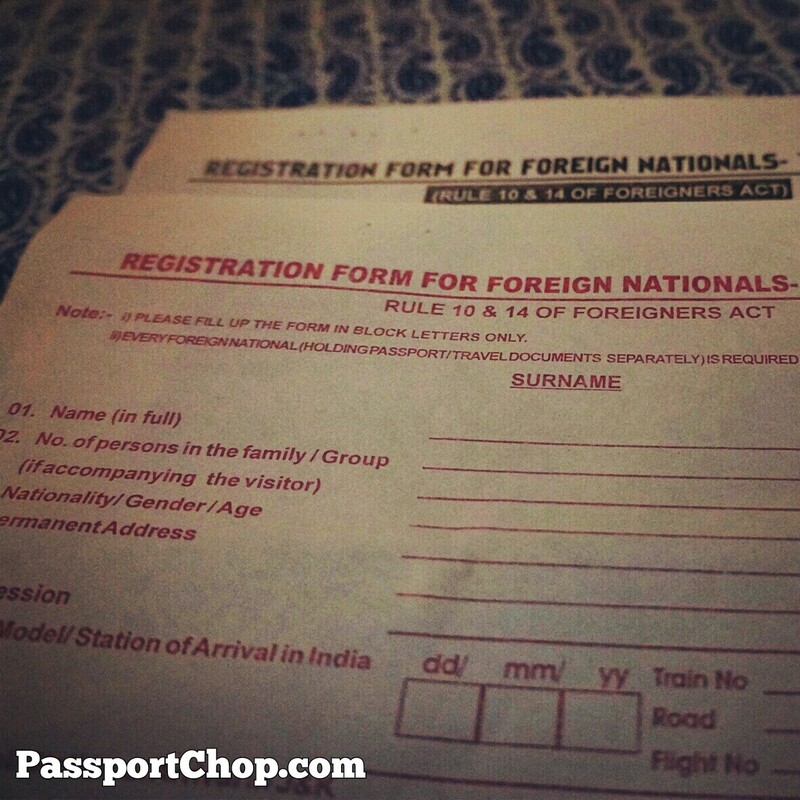 You will only need to fill up one form for your group of travellers i.e. if you are travelling with 2-3 friends, the group only need to submit one form. Remember – you need to register when you arrive and when you depart. Fill up your foreign national registration form (departure) before you arrive at the airport to skip the queues of foreigners getting their form. Get your arrival and departure forms at the counter upon your arrival. 1st layer: Clearance of vehicle driving towards the airport; Clearance of travellers and all their bags. This process will take up the most time – be prepared to get caught in a jam for 45 minutes and above, depending on the traffic. You will need to alight with your bags and send them through a huge scanning machine. You will go through a metal detector and then frisked. Collect your bags and board your vehicle after this station. 2nd layer: Clearance of travellers and all their bags just before you enter the airport. This is where you get your sticker for your checked-in luggage. After this layer, register your departure with the foreign registration counter. Do note that there is typically a very long queue going into the airport so set aside 20 – 30 minutes for this stage. 3rd layer: Clearance of travellers and their hand carry bags. This is where you get your stamp for your tag on your hand carry bag. After you submitted your foreigner national departure forms and checked-in your luggages (Do note that passengers have to identify their check-in baggage and no. of pieces before it is up loaded to the aircraft), you will proceed to the stage where you will need to clear your hand carry bags. Do note that at Srinagar airport, hand baggage is generally not allowed – you are only allowed to carry your cash, jewellery, electronic items and other valuables. You will be frisked here. Your bags will go through the normal scanner (but you will not get your stamp on your tags here) and then your bags will again be subject to a physical check where the staff will run his fingers along your laptop keyboard and ask you to turn on your camera to show that these electronic items are not shells hiding something else. After you clear this physical check, you will get the “precious” stamp on your hand baggage tag. 4th layer: Clearance of travellers and their hand carry bags at the boarding gate. At the boarding gate, you will again be frisked and your hand carry bags’ tag checked and the contents of the bags subject to another round of physical checks. Once you passed this stage, you will be allowed to board the plane. As you can see, the security clearance process at Srinagar airport is quite tedious and time-consuming so plan to be at the airport early and pack smart so that you can clear the security easily. For other airports around India, just take note of the type of stickers and tags and stamps you need to collect and you should be able to clear airport security smoothly. Jet Airways has introduced a 4-coupon “ONE FARE PASS” booklet to facilitate convenient travel on Jet Airways and JetKonnect flights in regional domestic markets. The ONE FARE booklets will contain 4 coupons which will be applicable for travel in both Premiere and Economy Class on domestic flights that are less than 750 km in distance. Each Premiere ONE FARE PASS booklet cost 49,216 Indian rupees inclusive of all taxes. The Economy Class ONE FARE PASS (Jet Airways and JetKonnect) booklet cost 19,606 Indian rupees inclusive of all taxes for Jet Airways, and 17,254 Indian rupees inclusive of all taxes for JetKonnect. The 4 coupon One Fare Pass will be valid for sale from November 21 to March 31, 2013. Travel validity is six months from the date of issue. This Pass is valid for travel from Delhi to Udaipur and Delhi to Srinagar routes so if you are planning a trip to Srinagar and Udaipur, this should help to achieve some savings and convenience for you. Do note that this Pass is available for sale only in India. Very Useful Information,thanks for sharing us a Useful Information. Do not bring any liquor bottles in the carry bag to the domestic flight, even if it is bought in the Duty free Shop at the Airport and it is in the sealed bag with the receipt.The security will confiscate it.. It is a punishment if you buy duty free items. in Indian Airports.